The wedding dress inspired by Cinderela had to be a traditional ball gown, but with a modern twist: sparkling tulle over beautiful taffeta have created a magical wedding dress that emulates Disney’s most famous glass slipper! 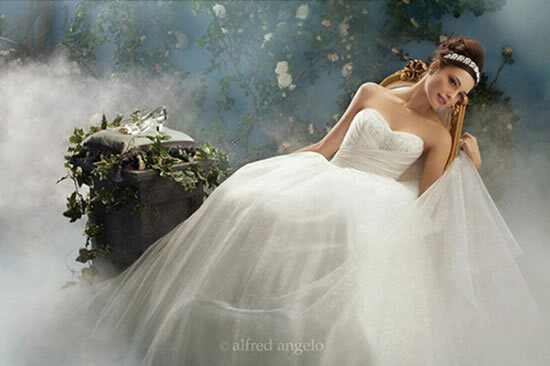 The creation of this romantic wedding dress used princess Ariel as inspiration and is entirely based on the free spirit that characterizes her. With lace and taffeta that move as graciously as the waves of the ocean, this wedding dress also includes nautical motifs and other details such as pearls, as well as some metallic and crystal touches… all of which create a wave of unexpected beauty. Awake to your own fairytale in this Sleeping Beauty inspired wedding dress that, covered in taffeta and numerous layers of tulle, emulates a cascade of rose petals, for truly romantic bride. 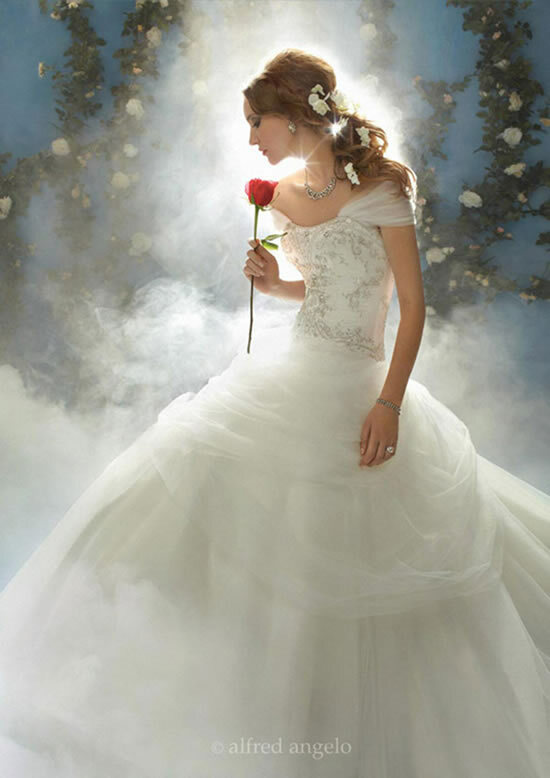 The upper part of the wedding dress is adorned with elegant lace, crystal and rose detailing. 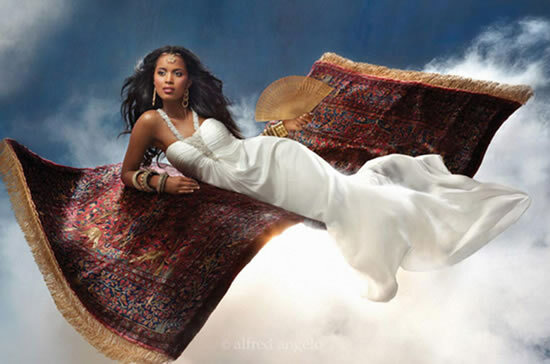 Bold and exotic, the Princess Jasmine wedding dress literally floats, thanks to the lightness of the sensual satin used to create it. Held together by a crystal and pearl encrusted necklace that exudes soft beauty, this wedding dress is worthy of any princess bride! 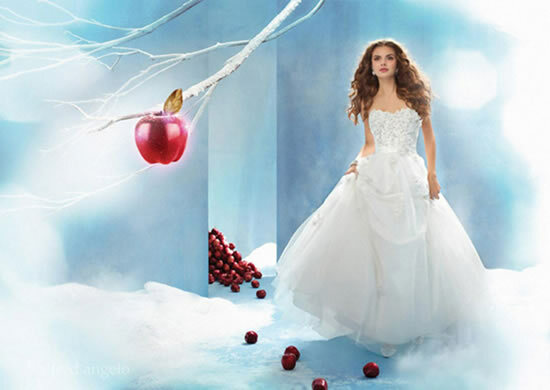 In order to capture Snow White’s gentle grace and beauty, as well as her inspiring nature, this wedding ball gown with tulle and silk, bustier in organza and adorned with flower, crystals and sparkling details, is complemented by a beautiful skirt also decorated with apple blossoms. 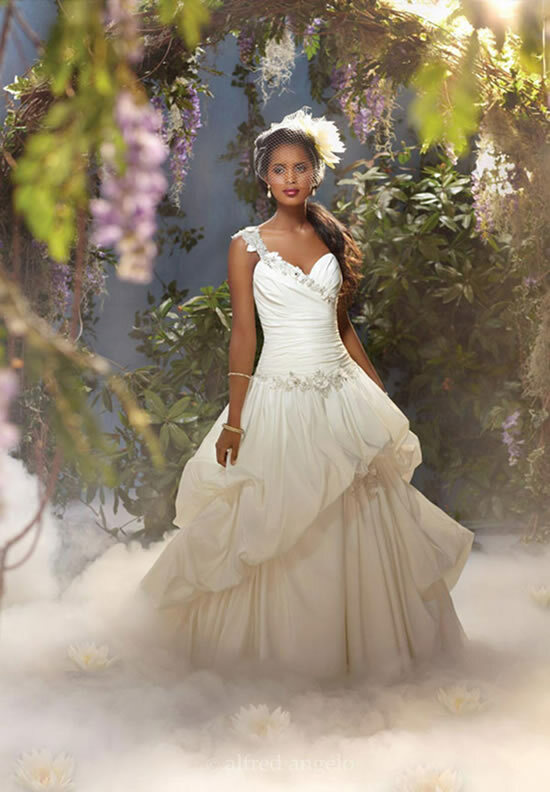 A satin belt with a beautiful bow on the back completes this super romantic Disney inspired wedding dress. As a tribute to Princess Belle and her gracious spirit, this wedding dress is stunning with its draped satin and crystal adorned corset, complemented by a long, wispy and silver toned skirt.